Warning the following guide will teach you how to completely delete files from your server. This needs to be run as root so be EXTRA careful before running any command and double check the files that you delete, these will be non-recoverable. If you are working on a small VPS it is not uncommon to accidentally run out of disk space. This guide will show you some commands you can run to help find extra large files and then delete them. The read out will look something like this. I am looking for the disk mounted as ” / ” this will be the primary partition. 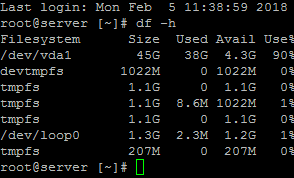 In this example my virtualization sets /dev/vda1 as the primary drive, it is on the first line and is at 98% full. Now to find what is using up all my space. The following command will search your server for any files that are larger than 100mbs and list them out for you. ##note the -R in the above command is for recursive, and is usually used for directories, adding -R will delete any files or folders that are in that directory. You will be prompted to confirm the file deletion. Make sure you have the full and correct file that you want to delete, once a file has been deleted there is no way to restore it. This command replaces all the data in the log file /var/log/munin/munin-update.log with a single space. Like “rm” once you have done this it can’t be undone so check the logs first to make sure you know that the info isn’t needed. Now that I have removed some of these larger files I can run “df -h” again and see the results.